Our Technicians Can Repair It. Call Us Today! If you're looking to have a new unit installed, you should have a basic understanding of these devices first. There are three main types of garage door openers to choose from, as well as a number of major brand names. All of these may have different features which are well worth exploring. To get started, however, it's a good idea to learn a little bit more about these three different types. The main thing that distinguishes them is the drive system they use. 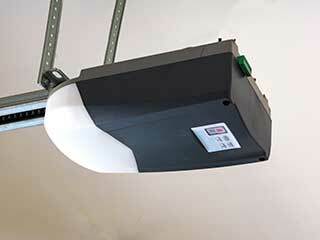 Models of this type are an ideal solution for anyone looking for a budget-friendly garage door opener unit. A chain drive opener is the cheapest option, and often the most powerful one. However, it can be somewhat noisy due to having metal chain links rattling every time you use it to open or close the door. If you don't have an attached garage this shouldn't be a problem. On the other hand, if you are concerned about noise output, then a different type may be better suited to your needs. These are relatively silent, although they do cost a little bit more than the other types do. The smoothness of the operation of belt drive garage door openers makes them an ideal choice for homeowners who want to minimize the noise output of their door, which is something many strive for, especially if their garage is right under or near a bedroom. A happy medium to consider is the screw drive opener, which makes a little bit of noise but is midrange in price. It does contain fewer parts than the other types of systems as well, which means it will require less maintenance, and it also boasts the fastest opening speed out of the three different types. However, it can be affected by drastic temperature shifts, which means it may not be the perfect choice for every home. In addition to choosing the type of drive system your new garage door opener will have, you'll also have to choose between the brand it will belong to. Marantec, Craftsman, and Amarr are a few of the industry leaders that our company works with. While many modern models offer a similar array of features, like WiFi and smartphone connectivity, and battery backup options, every brand tends to have special features, like the LiftMaster Security Plus and the Genie Intellicode, which are variations on rolling code technology. You can enlist the help of our team and have our experts go over the features that all of these different brands and models offer in order to ensure you're making an informed decision. Of course, of your current automatic opener starts exhibiting signs of trouble, and needs to have a problem with anything from the motor to the circuit board fixed, our specialists at Garage Door Repair Los Altos will gladly help. Call us today to learn more.